Whether your idea of holiday traditions include family or chosen family, tamales or baked ham, Houston offers some of the best events to make memories with loved ones this season. December 7th at Cullen Theater at Wortham Theater Center, The Houston Latin American Philharmonic presents its annual concert, Latin Christmas. In typical Houstonian fashion, The Houston Latin American Philharmonic is the only professional orchestra in the United States that presents programs of traditional Latin American music. Houston Symphony’s annual contemporary holiday spectacular returns December 7th and 8th with carols and cheer at Jones Hall. Held at one of Houston’s oldest and most stunning churches, Trinity Episcopal Church, The Bubbha Thomas Holiday Jazz concert aims to support those in need on December 8th. Free admission is granted by bringing five non-perishable food items or men’s socks. Queer up Christmas with Houston’s infamous LGBTQ outfit, The Houston Pride Band, performing Merry and Bright December 8th. Also at MATCH is award-winning barbershop chorus, Houston Tidelanders, presenting their 34th annual Christmas show, A Stolen Christmas on December 9th. Perhaps the most well-known theatrical holiday experience is the Alley Theatre’s A Christmas Carol — A Ghost Story of Christmas. Starting in November, this retelling of Charles Dickens’ classic tale runs until December 30th. One of the best excuses to get all decked out in your finest holiday theatre garb is The Houston Ballet’s annual production of The Nutcracker. From December 1st-29th, you can catch some of the country’s finest dancers take the stage set to Tchaikovsky&apos;s timeless score at Wortham Theater Center. Just a bit off the traditional holiday beaten path is MATCH’s production of The Christmas Revels, running from December 21st-23rd. Follow the story of an American teen given the history lesson of a lifetime by the ghosts of the Tower of London, featuring music, dance, and a mummer’s play. For those with children or just a lively inner-child, A Charlie Brown Christmas Live on Stage will appear on December 23rd for one night only at Galveston’s spectacular and historic Grand 1894 Opera House. If you prefer your holiday with a touch of delicious (and free) booze, look no further than the 12 Days of Tastings event at Marriott Marquis Houston. From December 3rd-12th, Marriott Marquis is hosting daily complimentary tastings of samples and cocktails from local breweries and distilleries, as well as nationally renowned beer, spirit, and wine brands from 5-7 PM. The 8th annual menorah lighting ceremony will be held at the Houston Galleria on December 5th from 6:30-7:15 PM. Hosted by The Galleria and Chabad Outreach of Houston, revelers can expect Chanukah treats and gifts for the kiddos and a children’s choir before lighting the magnificent 12-foot-high Galleria menorah. After a Harvey-imposed hiatus last year, The Heritage Society’s annual candlelight tour is back December 8th in Sam Houston Park. Hear tales of 19th-century life in Houston while touring some of the city’s most gorgeous historic properties. 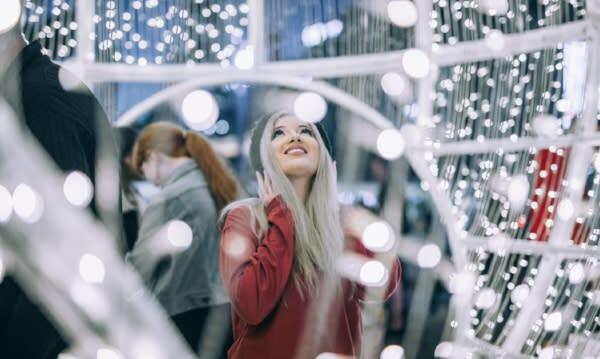 For more family-friendly fun, head out to Houston Zoo for the Zoo Lights tour (running through January 13th) or go ice skating at Discovery Green (running daily through January 27th).